Some bottled water is treated more than tap water, while some is treated less or not treated at all. Bottled water costs much more than tap water on a per gallon basis... Consumers who choose to purchase bottled water should carefully read its label to understand what they are buying, whether it is a better taste, or a certain method of treatment (EPA 2007b). 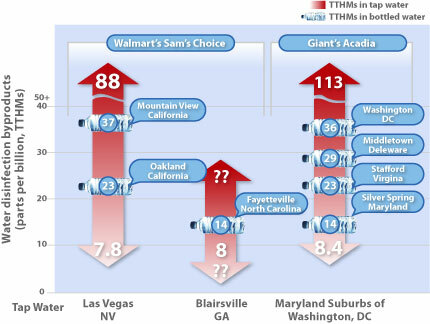 The municipal water sources of the Walmart’s Sam’s Choice and Giant’s Acadia bottled waters were identified through contact with Walmart representatives, their bottled water manufacturer, and city/utility officials; or from the label (Giant). Data on the levels of disinfection byproducts (total trihalomethanes or TTHMs) in these municipal water sources were obtained from Notla Water Authority in Blairsville, Georgia; Las Vegas Valley Water District; and Washington Suburban Sanitary Commission. These data were from tap water tests carried out in 2007, which the water utilities disclosed to their customers in an annual report. For every utility the range of values from lowest to the highest represents the concentrations of TTHMs that were found in the tap water over the course of the year. Notla Water Authority provided a single value for TTHMs, not a range. 3 EWG compared 5 different whole house carbon filter units and documented prices in the range between $64.99 to $795 per unit, with life spans between 3 and 36 months. Thus, the annual cost is in the range of $260 - $595 with an average of $375. This leads to an estimated cost of $1.00/day that translates into $0.25 daily cost per person for an average four-person household.